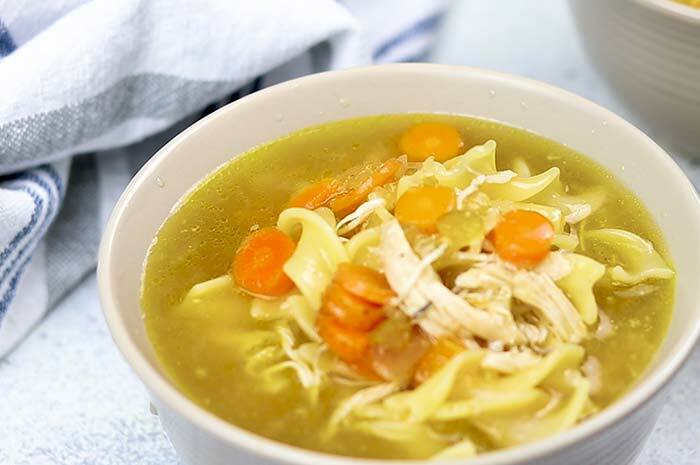 Sometimes you just need a bowl of Chicken Noodle Soup, and with an Instant Pot®, it’s easy. Making your own soup also allows you to control the chicken-to-noodle balance for a lower-carb option. When I was testing recipes for The Diabetes Cookbook for Electric Pressure Cookers, this chicken noodle soup got rave reviews. One person said “That chicken soup… is phenomenal!!! I don’t usually like soups with celery, but I ate 2 big bowls of your soup and it’s the best chicken soup I’ve ever had!” She told me she made a second pot as soon as she finished the first. That’s when I knew the recipe was a keeper. In addition, my Mom gave this soup a big thumbs-up. She was on a soft foods diet for a few months after having dental surgery and buzzed up some of the soup in a blender so she could eat it. She confirmed it’s delicious even when puréed. You might think you can’t eat things like noodles if you have diabetes. A bowl of this soup (with noodles) clocks in around 17g carb which is okay for me, but feel free to leave out the noodles entirely if that works better for you. The soup will still be tasty. The beauty of making your own soup is that you can control what’s in it. If you are diabetic then there are many diet restrictions on you. You have provided a delicious dish that contain essential nutrients and is acceptable during diabetes. Thank you so much for your post.